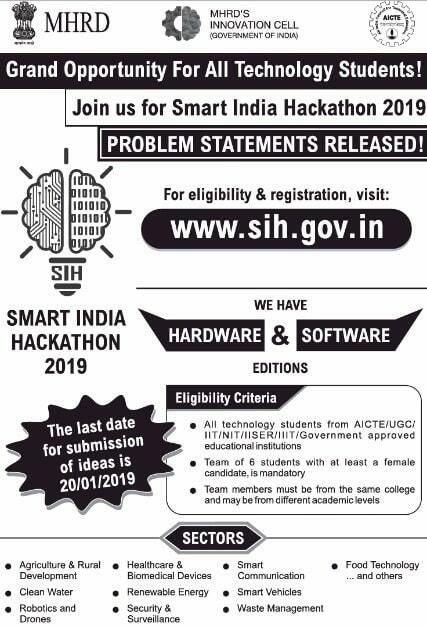 MHRD, AICTE, i4c & Persistent Systems are inviting Smart India Hackathon 2019 online registrations at the official website sih.gov.in to promote innovative ideas. SIH 2019 will turn development into a mass movement as innovation and entrepreneurship are at peak in India. Interested college SPOCS and student teams can submit their ideas before the last date 20 January 2019 for online idea submissions. Smart India Hackathon is a unique Open Innovation Model (OIM) to identify new & disruptive technology innovations to solve the challenges faced in our country. SIH 2019 is a non stop product development competition where problem statements are given to the technology students to get innovative solutions. Smart India Hackathon 2019 is an initiative to provide students a platform to solve some of the pressing problems which we face on our daily life. This will inculcate a culture of product innovation and a mindset of problem solving. SIH 2019 will provide students an opportunity to work on challenges faced within the private sector organisations and create world class solutions for some of the top companies in the world. This will also help the private sector to hire the best minds from across the entire country. At the homepage, click at the “Register” link present in the main menu and then in the pop up window select the “College Faculty SPOC” option. 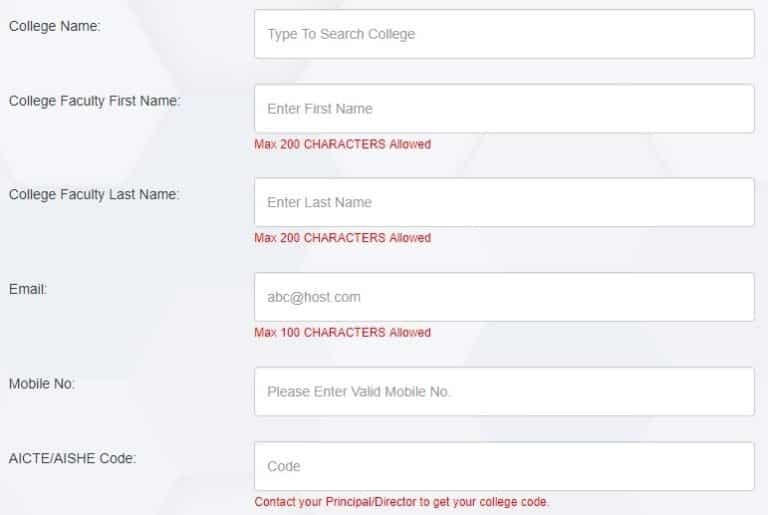 Here college faculty can enter their details correctly, upload downloaded consent letter and click at the “Register” button to complete the registration process. 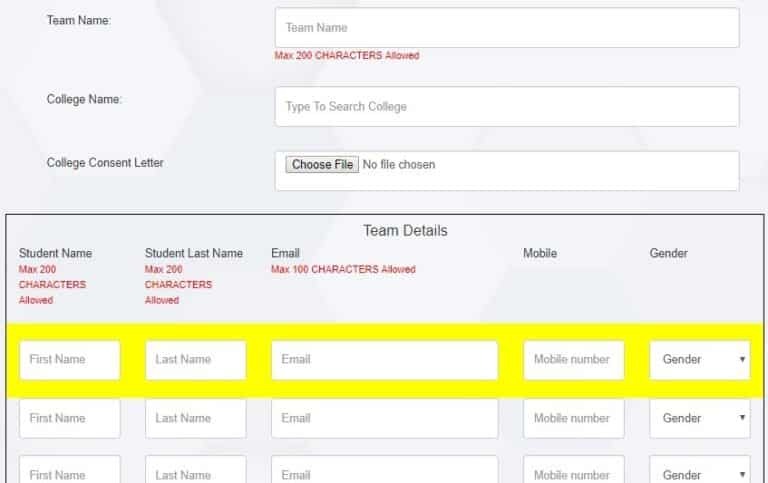 At the homepage, click at the “Register” link present in the main menu and then in the pop up window select the “Student Team leader” option. Here candidates needs to provide their team name, college name and other details and will have to upload the college consent letter. Finally, candidates can click at the “Register” button to complete the registration process. After completing the SIH 2019 registration process, candidates can make SIH 2019 Login to complete the application process. Moreover, candidates can lodge their Grievance in the SIH 2019 grievance form. Apart from getting solutions to problems in cost effective manner, this will provide an opportunity to brand your organisation nationally. To harness creativity and expertise of students. Providing spark to institute level hackathons. To support the massive Startup India campaign. Crowdsource solutions to improve governance and to raise quality of life of the citizens. To provide an opportunity to get innovative solutions to India’s daunting problems. SIH 2019 involves 1 lakh+ technical students, 3000+ technical institutions and 200+ organizations from India. This is the world’s biggest software and hardware hackathon. SIH 3rd edition will offer technology students to compete to creatively solve problems and offer technical solutions. In this advertisement published in TOI, candidates can also check the SIH 2019 eligibility criteria before filling the SIH 2019 online application form. The previous 2 editions of Smart India Hackathon i.e SIH 2017 & SIH 2018 were extremely successful. SIH 2018 saw over 5 million+ students from various engineering college competing for the top price at 35+ locations.These 2 versions promoted innovation and out of the box thinking of the aspiring youths, especially engineering students from the country.